An Interview with Jon Katz. · One Book. One Author. One Hour. Lindsey Bestebreurtje (Oral Historian), “An Interview with Jon Katz.,” One Book. One Author. One Hour., accessed April 24, 2019, http://booknotes.gmu.edu/items/show/2774. 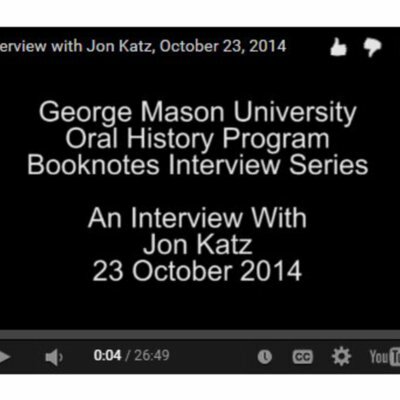 Jon Katz is interviewed as part of the Booknotes Oral History Project on 23 October 2014. Mr. Katz discusses his appearance on C-SPAN's Booknotes program on 23 March 1997, where he discussed his book "Virtuous Reality: How America Surrendered Discussion of Moral Values to Opportunists, Nitwits and Blockheads Like William Bennett." 1:36 – John Katz was contacted by Brian Lamb to be on the program because Lamb was interested in Katz’s media criticism. 2:04 – Katz did not prepare very much for his appearance on the program because his book was largely an opinion book. 2:52 – Katz remembers how thorough the interview questions were and how closely Lamb had read the book to prepare for the interview. The in-depth questions were unique for the time and have since become even more rare. Katz talks about Lamb being on the forefront of interactivity and audience engagement. 5:50 – How thoroughly Lamb prepared for the interview and the length of the interview allowed you to get into more details. Sometimes you see programs like this abroad, but not in the U.S. People still approach Katz about this interview and he believes that is because of the interview’s depth and thoughtfulness. 8:14 – Katz thinks that there are no drawbacks to the Booknotes format for the author, but that time could be a drawback for the audience. Katz praises Lamb for his non-partisan nature and recognizing the importance of all opinions. 12:29 – Readers are very interested in the process of writing. Katz thinks that this is because most of the world wants to be an author, read good writing, or at the very least are fascinated by writing. No one else asks these kinds of questions and Katz thinks that is a disservice to both the author and the audience. 15:52 – The biographical questions which Lamb asked were “radically different” from what Katz experienced at other interviews. Lamb’s interest in an author’s background was a “holistic approach” to see what biases and influences were brought to the work. 17:18 – Despite having seen the program before, Katz was surprised by quite a few of Lamb’s questions because of their thoroughness. The questions kept him on his toes. 18:08 – Katz had seen the show but wasn’t an avid watcher of CSPAN because he doesn’t enjoy either D.C. politics or watching television. 19:22 – Katz thinks George Mason Univeristy’s Booknotes collection will be very useful for the study of authors and their influence in politics to see the role of publishing in American life. 20:18 – Katz would have loved to appear on Booknotes again. He felt that the rule that an author could only appear on the program once was arbitrary, instead feeling it should be judged on the book. But he does recognize that this kept Lamb from playing favorites. 21:08 – There was not a big jump in sales or national attention after his appearance on the show. But, publishers and members of the “loyal, rabid” CSPAN audience were brought to his work as a result of the interview. 22:03 – The conversation they had about publishing and process reinforced Katz’s writing process. 22:38 – Katz has moved on from media criticism and now writes about animals, rural life, and farming. Media changed so much that he was not comfortable with it any longer. 24:20 – The lasting impact of Booknotes is that it sanctified and respected the writer in American life, giving them the unique opportunity to be heard and articulate their values. The program preserved a way of looking at the world which Katz hopes will be revitalized. 26:00 – Lamb was admirable, consciousness, and unique and Katz considers being interviewed by his to be a high-water mark in his career. Booknotes Oral History Series. R0143 Box 02 File 02.